Hey JMU! I’m Carrie Martin, the Coordinator of UPB. During the summer, I work to get things prepared for when you get back in August. Part of this responsibility includes working with the Center Stage committee to prepare the fall concert survey. This summer, almost 6,000 of you took the survey to give us your input on whom to bring! This organization has the responsibility to represent ALL student interests in programming choices, and this huge response on surveys definitely helps to make those decisions easier. I’ve noticed, however, that there are a lot of questions about how we make the survey and use the results. Hopefully this blog post can clear some things up. After we get the results of the survey we think about a lot of things. Which genre is the most popular? For every person who says, “If you pick another rap/hip hop artist to come to JMU for the Fall concert, I might consider getting a lobotomy” (actual quote), there is another person who says “no country” or “I’m sick of rock”. Also, whom can we still afford now that a month has gone by and prices have changed (sometimes drastically)? Are they available on the few dates that the Convo Center is also available? There are very few artists that meet all of these qualifications. Part of our purpose is to bring fun things for you to do all year. Sometimes I wish we could go all in and spend all the money on a huge artist, but we aren’t allowed to. And if we could, what would you do for the rest of year? Plus, I probably wouldn’t have a job anymore! I’m a fan of some underground bands too, and wish that everyone else shared that love. However, we have to pick an artist who is going to sell at least 2,500 tickets just to make some of our money back (we never make a profit, and don’t try to). “Dave Matthews Band”, “Lady Gaga”, “Dane Cook”, “Taylor Swift” and others are WAY out of our price range. These artists typically won’t play college dates either. Sorry! “You should offer more floor seats! You had plenty of room left at the Wale Concert!” We wish we could. However, we are limited by fire safety guidelines to only 544 tickets. Finally, “Michael Jackson, The Beatles, Tupac, Janis Joplin, GREMLINS ON THE WINGS OF LOVE.” Funny! There are a TON of great suggestions that we definitely keep in mind. THANK YOU for such creative ideas – it keeps my job really exciting! As you continue to think of more, please let us know. You can always email new event ideas to upb@jmu.edu, become our fan on Facebook and write on our wall, and tweet at us on Twitter! Keep your eyes open for the fall concert announcement over the next couple months – I promise to try to get someone great! Cartel, the first act in the Wilson Concert series, is set to perform THIS FRIDAY, September 24 at 8 p.m. By doing three Wilson shows we are breaking UPB tradition a little bit. Why not break it a little bit more? For past Wilson shows we have received a variety of complaints ranging from not being able to stand on the floor in front of the stage to not being able to see from some seats. Being an organization with JMU students’ best interests in mind, we realized it’s time to make some changes. First, every ticket sold for the concert will be general admission. Instead of searching for your seats and missing valuable show time, now you may sit wherever you please. Whether you prefer the full and complete sound that comes from sitting farther away, or you prefer the up-close and personal approach that comes from sitting closer, we feel this is advantageous for everyone. Now clearly, the earlier you arrive the better chance you have of getting your seat of choice. So for the most dedicated fans, we are allowing a limited number to stand on the floor area right in front of the stage. If you are one of the first 75 people in line, you will receive a wristband to stand in this coveted area at no extra charge. Wilson Hall, being a place of JMU business, cannot have people lined up throughout the day so the line will begin at 5 p.m. sharp, the day of the show. Unfortunately we cannot allow more than 75 in the floor area, but remember any ticket can be as good a seat as you want it to be! Good luck! Looking for a way to escape all the work you have so far this semester? For the last couple of weeks I’ve been telling myself I need a vacation! And thanks to UPB I’m finally getting one. TONIGHT UPB is hosting a Luau Late Night Breakfast where everyone can enjoy a night out having fun with friends! ladder ball, hula hoops or sand art! And of course dancing! Make sure you check out Late Night Breakfast this month and every month after that! On Monday, September 13, Greg Hoeflicker paid a visit to JMU’s campus to bring some clarity to some of our most blurred memories… dreams. Greg has been a dream interpreter since he was 19 years old. He started his studies in the Midwest by attending a school that was geared towards meditation, focus and concentration. His schoolwork later led him to focus his life on dream interpretation and to travel and share his knowledge with others. He started to teach others what he had learned in his studies and continues to translate all of his friends and families dreams. This past Monday Greg started by telling his audience at Grafton a little bit about his past and then listened to different dreams from the audience and deciphered what each symbol and event in their dreams meant. One audience member shared his dream of being trapped in a maze and being chased by the undead, but no matter how far he ran he would never get any closer to leaving the maze and escaping the things chasing him. Greg told the listeners that this dream was completely related to trying to take a certain path in life, but the final answer was a path that hadn’t been discovered yet. Another popular dream concept was teeth. Whether it was then falling out or growing extra ones, Greg said that teeth commonly represent the tools used to gain wisdom. 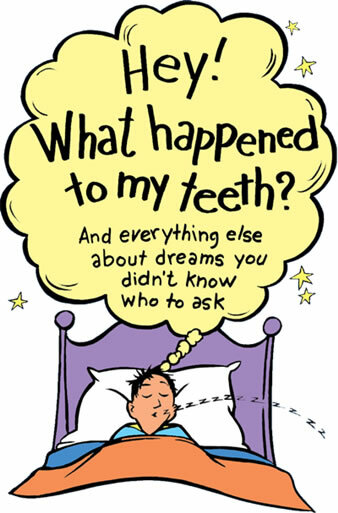 In other words, if you have a dream about teeth, then you most likely have either taken in or shared knowledge within the past couple of days. He ended with a few final words of encouragement, to always try and listen to your dreams, because you never know when one will give you the exact answer you’re searching for in life. Dreams are weird. Plain and simple. Everyone has them and don’t tell me you’re one of those “special” people who don’t. One thing is for sure, and that is my hecka crazy dreams. My dreams never seem to make sense and I’m sure you’re in the same boat, which is why having professional dream interpreters like Greg Hoeflicker come to campus TODAY Monday, the 13th from 7-9pm at Grafton (FREE!) is such a great thing. Now, I’m telling you, my dreams are straight up bizarre. How bizarre you didn’t ask? Well, last week I had a really depressing dream where I had an incurable illness, so I basically just gave up on life and was moping about. Understandable, yes – but I’d say I took it pretty well; I remember having only one crying fit through the whole thing, and it wasn’t even that bad of sobbing. More like sniffling. Manly sniffling. And guess what? I still showed up to work the next day! Talk about dedication, people! I was 18 minutes late in my dream, but that’s beside the point. What does it all mean? Well, I guess it could be some sort of commentary on the stress that comes with every new semester along with the new addition of work to go with it, but I’m no expert. Luckily for me and all of you, Greg Hoeflicker is. Now, eleven years later, Pixar has come out with Toy Story 3, which is all about Andy going to college and having to give his toys away. I was twelve when I packed my Barbies away to be given to my mom’s school, and I felt just like Andy did- nostalgic and devastated. Trust me, you will cry when Andy has to make his final decision at the end of the movie, or at least tear up and pretend there’s something in your eye. 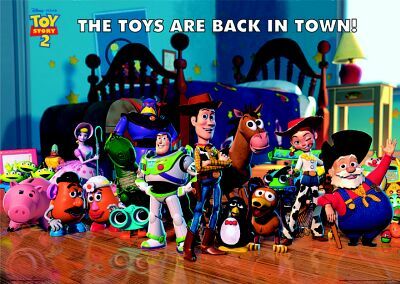 Watching this movie, it brought back so many childhood memories of playing with all my toys. I was taken back to a carefree world where I could spread my Barbies out in my living room and set up a school, a house, and a movie theatre. Now that I’m a senior in college, I can’t take over my apartment’s living room and spread out my Barbies (which I sometimes wish I still had, especially when I’m babysitting and I get to play with them again). Now I have the chance to see this movie again TODAY, September 12, at 2pm! It is guaranteed to be a toy-tastic event! See you all there!